Bruce Poulterer -- Painter of Memories. 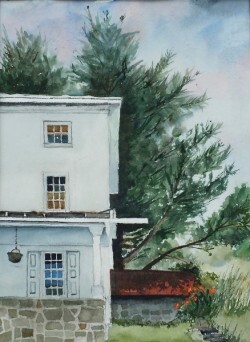 Bruce, a realistic watercolor painter, has his home and studio in Media, PA. He began painting by painting from the watercolor box his mother used. He studied under a number of watercolor artists most recently with Karl Kuerner. Bruce is most known for his paintings of buildings in country landscapes and everyday life, when life moved at a slower pace. His career has been marked by consistent growth, beginning with designing and painting watercolors for Christmas cards and prints for his own company for 20 years. These prints hang all over the world and there is hardly a dairy in the United States that doesn`t have one of his prints. 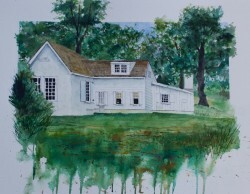 Juried art shows: Plein Air Brandywine, Imaculata College, Yellow Springs, Lititz Art Show, Brandywine Arts Festival, Malvern Art Show, Chadds Ford Art Show, etc. Bruce has also had numerous one man shows and will be the featured artist at Christopher's Restaurant in Wayne in October. Honors: First limited edition watercolor selected by Dressage at Devon Horse Show benefiting Children`s Hospital and Penn State University used his Limited Edition watercolor to raise funds for the Food Science Building. Bruce feels blessed and has given his work to raise substantial funds for many non-profits such as Delaware County Christian School, Chester County Hospital, People for People in Philadelphia, and many others. 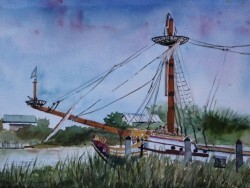 He is a member of the Delaware Valley Art League and Member of the Philadelphia Watercolor Society. 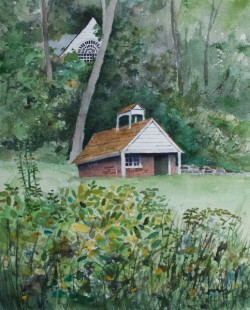 Bruce has been painting plein air watercolors since 2009. 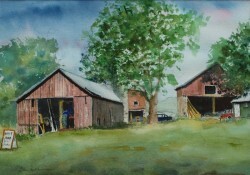 Recently he has been plein air painting at the Kuerner farm where Andrew Wyeth painted and sketched over 1,000 pieces. Under the insightful eyes of Karl Kuerner , Bruce says this has been one of the most significant painting experiences in his life. Or like Bruce at Bruce Poulterer watercolors on FACEBOOK to get regular updates.